Your work history is used to determine if you earned enough wages in insured work to establish a claim. Insured work is work performed for any employer that is required to contribute to the Unemployment Insurance Trust Fund. An unemployment claim is established using a Base Period determined at the time the claim is established. 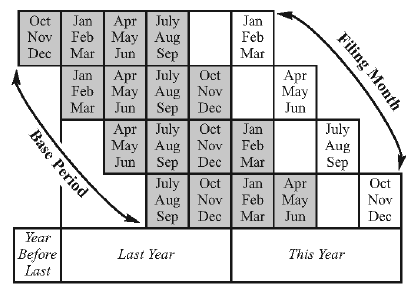 In Missouri the base period is defined at the first four of the previous five completed calendar quarters immediately preceding the quarter in which the claim begins. See below to determine base period of an unemployment claim. *Base Periods always begin on the first Sunday in January, April, July, and October. Any days prior to the first Sunday date are part of the prior Base Period. · You must earn at least 1.5 times the Taxable Wage Base during at least two of the four quarters. · In excess of 5 times your current weekly benefit amount for wages earned in Missouri or 10 times your current weekly benefit amount for wages earned out of the State of Missouri.